Sorry we couldn't find anything for ""
What type of Freshpet food is right for my pet? Freshpet believes in the difference fresh dog and cat food can make to the health of your pet. The choice between Freshpet recipes really depends on the individual needs and preferences of you and your pet. To find a recipe that fits your family, use our Product Selector tool. Learn more about our wide selection of fresh food here. Where are Freshpet foods and treats made? All Freshpet refrigerated food is made in our very own Freshpet Kitchens in Bethlehem, Pennsylvania. Freshpet treats are made in the USA by carefully selected partners that are required to strictly adhere to our high quality food and safety standards. Where can I find Freshpet? Freshpet is carried in many stores across the USA, UK, and Canada; including grocery, mass stores, pet specialty, and natural food stores. To find a Freshpet retailer near you, visit our Store Locator. Is Freshpet food raw? Is there a risk for parasites or harmful bacteria? Freshpet is not raw, but a steam-cooked food for cats and dogs. Freshpet refrigerated food undergo pasteurization similar to milk and other freshly prepared food, making it safe for handling and serving. Where do Freshpet ingredients come from? 97% of Freshpet ingredients come from the USA and Canada. Our vitamins and minerals are sourced outside the USA, however no ingredients are sourced from China. Our focus is on finding the highest quality and freshest ingredients out there. While our foods are not organic, they are all-natural, antibiotic and preservative free. Is Freshpet food all natural? Yes, we make Freshpet with only all-natural ingredients. 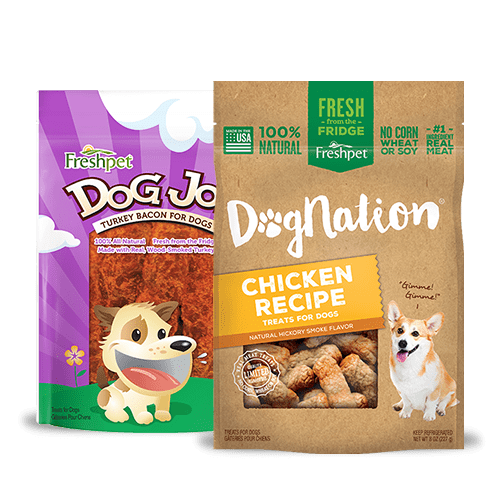 Our recipes also never contain any artificial or chemical preservatives, BHA, propylene glycol, flavors, or colors commonly found in traditional dry, canned and semi-moist pet food. How does Freshpet verify the quality of their meats? All Freshpet poultry and meat ingredients are sourced from USDA (United States Department of Agriculture) and APHIS (Animal and Plant Health Inspection Service) registered suppliers who follow all USDA regulations for safe handling. Our fish are source from USDC/NOAA registered sources. 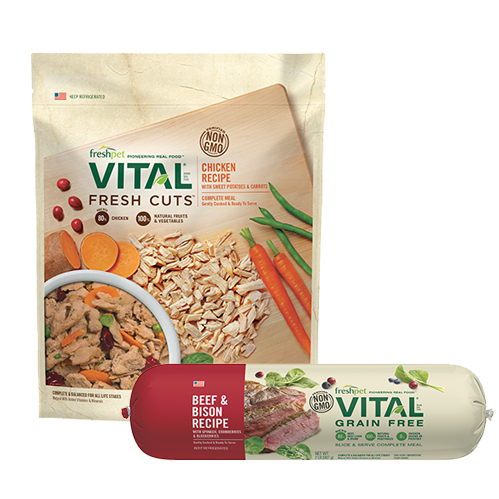 The poultry used in our Nature’s Fresh and Deli Fresh recipes are antibiotic and hormone free. 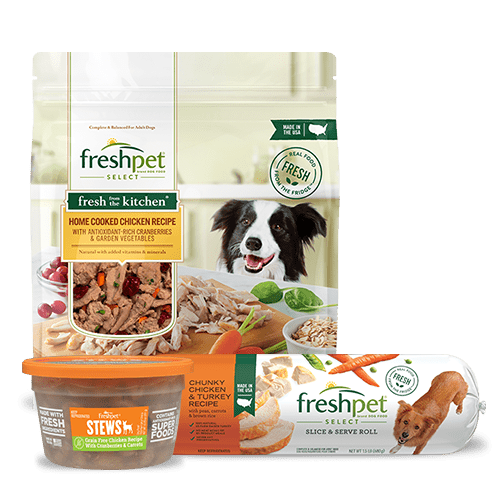 Why does Freshpet use fresh meats instead of rendered meals? 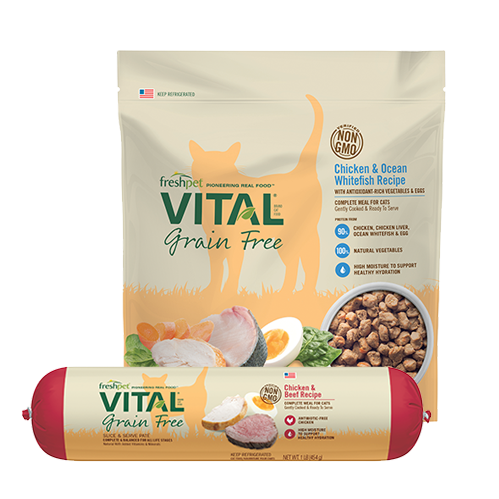 Freshpet uses only muscle and organ meats held to higher quality standards and have never been pre-processed as it is more nutrient dense and easier for our pets to digest. We also choose to never use any “chicken meal” or “meat meals.” Meat meals can include varying types and qualities of meat and waste products, are highly processed, and can have a shelf life longer than a year. Learn more about the differences between fresh meats and rendered meals here. Tapioca is a gluten-free starch naturally derived from the root of the cassava plant that is used in some Freshpet recipes to help combine the fresh ingredients together. It is often used in human foods such as soups, sauces, cheese and gluten-free bakery items. Carrageenan is an extract from red seaweed found in the North Atlantic coastal regions. Freshpet uses small amounts of undegraded carrageenan as a thickener or gelling agent to help improve the form and texture of our food. Undegraded carrageenan has been found safe for use in both human and pet foods by the FDA, USDA, and is deemed natural by the National Organic Standards Board. Inulin, also called chicory root, is a prebiotic, which helps with nutrient absorption. It is a high quality, soluble and functional fiber source, which aid in the absorption of nutrients into the bloodstream, especially in foods that contain high amounts of fresh meat and fish. Natural flavors are a proprietary blend of natural ingredients used to enhance the flavor of our fresh foods. Why do your products contain salt? Shouldn’t we monitor sodium intake in pets? Freshpet uses minimal amounts of salt and potassium chloride (lite salt) in our recipes to help combine our fresh meats. Our salt levels are within the ranges recommended by veterinary nutritionists. What makes Nature’s Fresh different? While all of our foods are made of all-natural, high quality ingredients, Nature’s Fresh recipes only use chicken that follows the standards developed by the Global Animal Partnership – The 5-Step™ Animal Welfare Ratings Standards. These standards are used to rate how pigs, chicken and cattle are raised for meat. What is the best way to switch to an all Freshpet diet? When switching from another brand of pet food to Freshpet, we recommend doing so gradually over a period of 7-10 days. Please refer to our guide on Switching to Freshpet for more information. Can Freshpet food be frozen and stored in my freezer for future use? We recommend serving our food fresh from the fridge for the best results, but you can choose to freeze any unused portions for later use. Be aware that you may see a slight change in color and texture when thawed, but this won’t change the nutritional value or taste of our meals. No Freshpet food is frozen before being purchased at your local store. How can I tell if the product is fresh when I buy it at the store? Once served, how long is it safe to leave Freshpet food in my dog or cat’s bowl? Treat Freshpet refrigerated food as if you would freshly prepared foods at home. We recommend that you do not leave refrigerated food in the bowl for longer than 2-3 hours. Return any unused food to the fridge when you’re finished serving. How are Freshpet treats different from other dog treats? Freshpet treats are all-natural, contain no artificial preservatives, and are less processed than traditional pet food. To ensure the freshness of our simple and healthy ingredients, all Freshpet treats must be refrigerated and used within 14 days of opening. Is Freshpet complete and balanced nutrition? Freshpet foods are 100% complete and balanced and exceed AAFCO’s minimum standards for canine and feline nutrition. While Freshpet treats are made of high quality meats and vegetables, they may not contain all the essential vitamins and minerals dogs need. To ensure your pet is getting all the nutrition he requires, feed a complete and balanced food. The moisture or amount of water in Freshpet food seems high, why is this? Why does traditional dry food seem to have more protein than Freshpet food when I look at the Guaranteed Analysis on the label? This same formula can be used to determine the dry matter fat and fiber contents. Click here to compare our foods with other brands. Is the protein level in Freshpet recipes appropriate for all dogs? For pets that have pancreatic problems or compromised renal function (i.e. kidney), high protein diets made from meat and fish should be avoided. If your pet suffers from these conditions, consult your veterinarian to determine if Freshpet is appropriate. Our Care Team would love to hear from you! Send us a note by filling out the form below – you can expect a response from us within 48 hours. To write a review, click here. Hey, looks like you're on the Freshpet Canada contact form! Are you from USA, or UK? Do you know the product's 12-digit UPC code? If not, continue down to select the Brand and Product name. Please select a brand you’re writing about. Choose a product you want to write about.